Can we reach 1000 loans before the FT anniversary (5 May)? I've just made the 1'000th loan for the team! Go FlyerTalk! Yes, certainly you can. You have try to get 3000 loans. N830MH, you are right, of course. In the meantime, I think it's terrific our team has made 1'000 loans, exceeding $30,000! Programs: UA 50K, refugee from AC E50K. I think it's terrific our team has made 1'000 loans, exceeding $30,000! Out of curiosity, are you helping us reach the next goal? I just stumbled upon this thread and found it to be very interesting. I am still trying to go through so many posts. Can someone explain to me the risk factor. What are the chances that you will lose money. What if the lender defaults? How are you paid back such bad loans? It doesn't happen too often but there is always the chance that you will get stuck. I have made only one loan ($100) and if I don't get a cent of it back I figure I will be out the cost of a single dinner with my girlfriend in Milan. Of course, you can reduce the risk by making smaller loans. If I had made 4 loans at $25 each I would have spread out the risk and, in the worst case, loss less than the price of a carton of cigarettes. What are the chances that you will lose money. What if the lender defaults? How are you paid back such bad loans? I've made several dozens of small loans over the years and have been paid back every cent. And the truth of the matter is that I don't really care if I get all my money back. As with most donations, it's usually a one-way street. Money goes one direction and hardly ever returns. And that's cool. 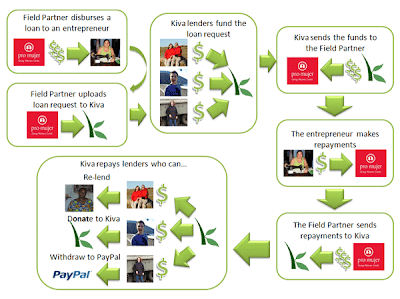 As I get money back from my Kiva donations, I re-lend it quickly. To add to the other comments, after 50 loans, I've lost $0.84 on currency exchange losses. For the rest, all my loans are being paid back. I had one loan where the country partner had issues, which was repaid late, but it was repaid. I don't know if I've lost anything on currency fluctuations. I actually don't care if I have - I'm not in this as a profit making venture. Anything repaid is quickly re-loaned anyway. I have no intention of ever recovering the principle I've put up for this. Like GenevaFlyer I have 1 loan with country partner issues. The loan is being repaid, albeit incredibly slowly. Anyway, it's not like I care about the $25. I am greatly more concerned about the group of ladies who were (theoretically) the recipients of this loan. I wish I could find out how they're doing. ... I am greatly more concerned about the group of ladies who were (theoretically) the recipients of this loan. I wish I could find out how they're doing. Did you check on the loan repayment details (click on "Show Advanced")? This will show you whether your group has been repaying to the field partner or not. In my case, I could see that my borrower had repaid her loan in full to the field partner, it's just the field partner who is/was having a spell of bad loans. And like you, I don't indeed care if I lose the occasional bit, and just keep relending the funds I have in there. I have done a lot of my loans to Ukraine Azer Leb and the Central Southern Americas...MR and an extended counrty stay might be sort of interesting. Of the people cycling money with FFcc's to Paypal then to your bank, what is the average amount you are doing on a cycle. It seems to me if you are churning a $1000 to 2000 a month you could easily end up with some type of reward ticket a year. I am stll mid way thru my inital cycle of 100$ to see the timing so as not to have a large amount hanging on the CC to draw a finance charge.